ver the past 30 years, many people have asked how they can grow algae themselves in their own back yard. 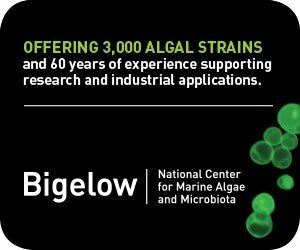 The good news is that small scale algae farming has been tested for 30 years all over the world, and models are soon being introduced as effective algae growing systems for gardeners, farmers and algapreneurs who want to grow algae but don’t have years of scientific expertise or cultivation experience. 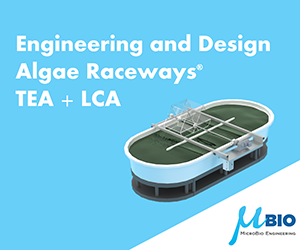 Algae microfarming is a perfect fit for the growing Do-It-Yourself movement and the trend of growing food and herbs indoors, in greenhouses, in empty lots in many urban, backyard and community gardens. A few entrepreneurial growers have emerged, mostly below the public radar in countries like France, growing spirulina algae in outdoor covered greenhouses, because of its relative ease of cultivation. Parallel to open pond systems has been research and development on small enclosed, high-tech bioreactors designed to grow algae under more controlled conditions. For many years, Jean Paul Jourdan, developed algae projects in Europe and Africa. In his popular practical manual published in 2002, Grow Your Own Spirulina (Cultivez Votre Spiruline,) he describes how to cultivate algae on a family scale. Since 2002 Jean Paul has edited a monthly newsletter called Petites Nouvelles de la Spiruline. From 2004-2008 he was professor of spirulina culture at the CFPPA Center in Hyères, engaging many of the future producers from southern France to as far north as Brittany, Savoie and Alsace. He is a consultant to the Fédération des Spiruliniers de France. At his algae greenhouse microfarm in Le Castanet in Mailet France in 2002, Jean-Paul demonstrated how he grows, harvests and dries spirulina, producing a tasty product. When he moved to a more northern part of France in recent years, Jean Paul developed an insulated growing tank in his backyard to keep the algae culture warm and grow all throughout the year, even in winter. The Future of Spirulina Algae Microfarms: a conversation with Jean-Paul Jourdan. 3:35 minute video with Jean-Paul Jourdan and Robert Henrikson. (2011). In Oakland California, Aaron Wolf Braun founded AlgaeLab (algaelab.org) in 2008, first rehabbing a 20’ shipping container for a portable laboratory and community algae lab. 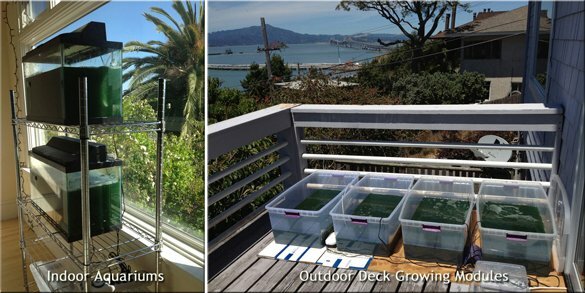 For several years he has led Home Grow Algae Workshops explaining how a personal algae photo-bioreactor in one sunny window can provide enough to significantly supplement the diet of one person every day. Participants who complete the workshop take home an aquarium growing kit and all the supplies needed to grow at home. The workshop supplies a 10-gallon home-grow kit which includes tank, heater, air pump, air diffuser, air tubing, valves, starter and make-up nutrient powder mix, pH testing, harvesting tube, harvesting cloth, clips, plug timer, and 1 liter live spirulina. 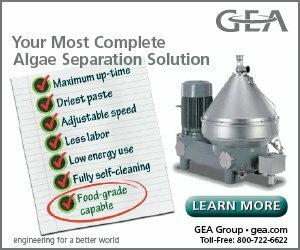 The AlgaeLab.org online store also offers supplies needed to grow at home and the website has pictures of the cultivation and harvest processes. In Richmond, California, Robert Henrikson, CEO of Smart Microfarms, has been developing a series of simple scalable platforms. Robert was a founder of Earthrise, which became the world’s largest spirulina farm in the 1980s, still producing today as Earthrise Nutritionals in Imperial Valley California. Having pioneered big commercial farms 35 years ago, the time has arrived for small scalable algae systems. Smart Microfarms is currently testing, growing and harvesting spirulina on a small scale producing fresh, frozen and dehydrated products for family and local consumption as a daily nutritious food supplement. These small indoor and outdoor systems were built with locally available supplies. Modular growing systems for cultivation indoors and outdoors on porch deck or backyard are designed for scale up to larger sizes. The materials cost range from hundreds of dollars for small systems to thousands of dollars for scaled-up larger community greenhouses. More details will be upcoming from SmartMicrofarms.com by spring 2013. Smart Microfarms. Algae Growing Systems for Home & Backyard. 2:08 minutes (2012). Here’s a quick demonstration of simple home and backyard systems for growing and harvesting spirulina. Growing at home, algae can be eaten fresh, frozen or dried in a food dehydrator. Fresh harvested spirulina is a thick paste like yogurt, dough or tofu depending on how much water is removed. Best of all, unlike the dried powder, fresh has almost no taste at all, and can be mixed into any juice for a fresh green drink without changing the juice flavor! A tasty way to consume fresh paste is in recipes for dips and spreads, popular in France. See a video “How to eat fresh spirulina algae in Aquamole dips” blending fresh spirulina with yogurt, cream cheese, herbs, and guacamole spices for a savory green dip for crackers, chips and bread. Algae are being grown in outdoor ponds, greenhouses, photo bioreactors and fermenters and hybrid systems combining bioreactors and ponds. As new technologies and systems design arrive, algae microfarms will be less costly, easier and more accessible for more people around the world. Emerging technology will stimulate a distributed model of scalable growing systems and local community microfarms, growing algae for valuable food and biomedicines for the nearby region.